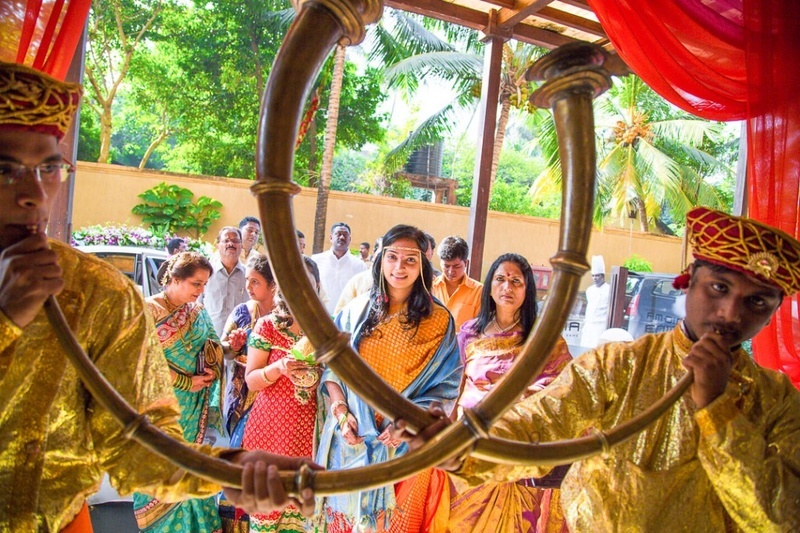 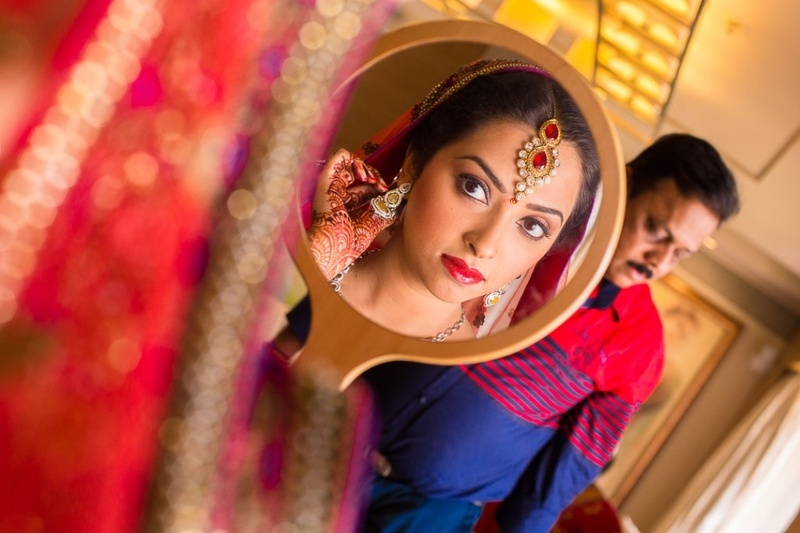 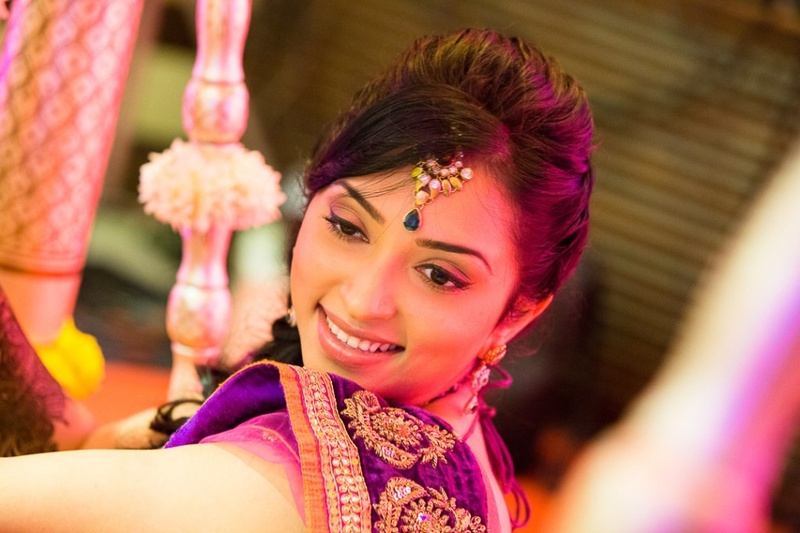 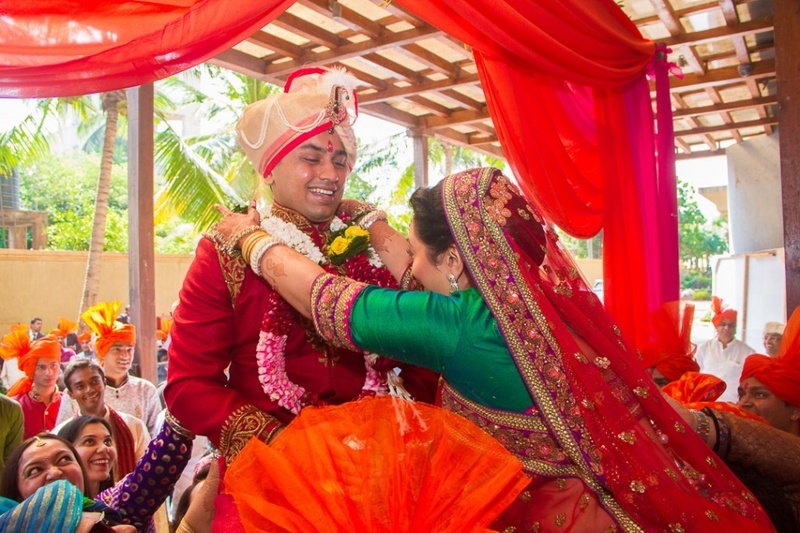 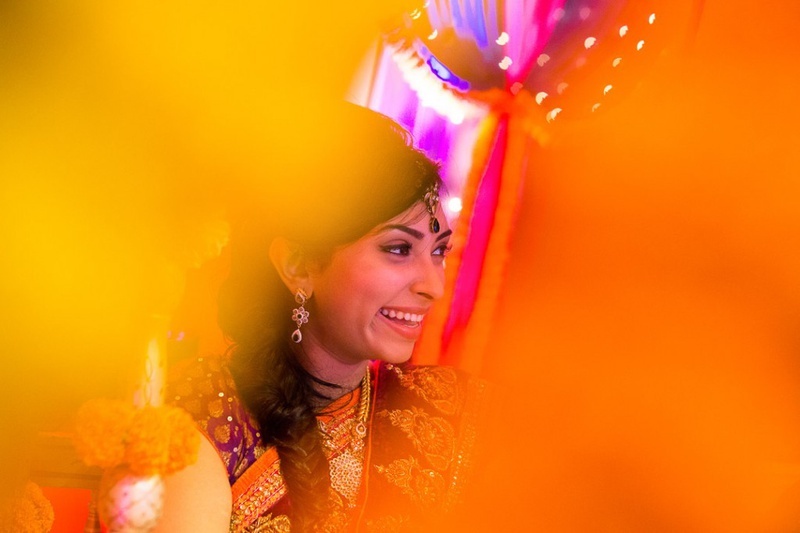 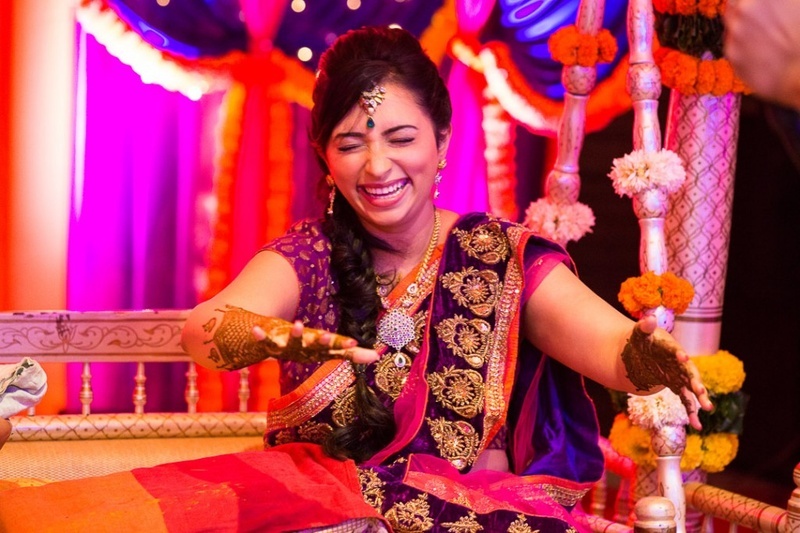 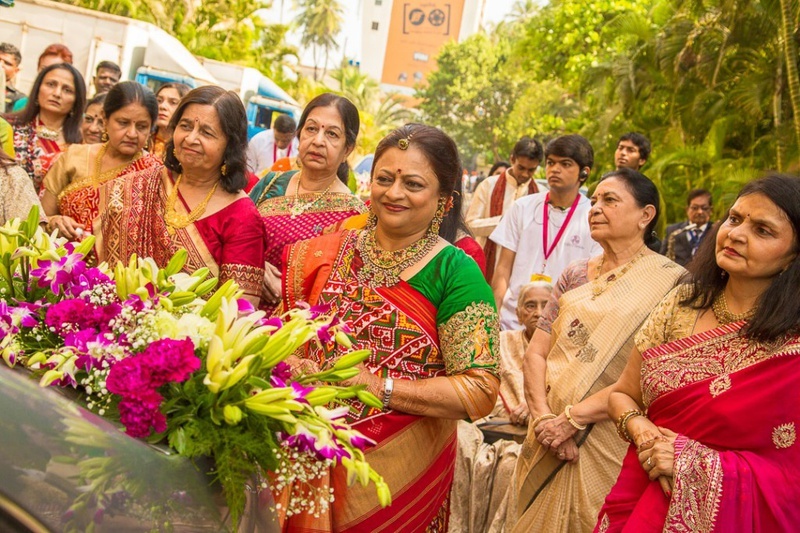 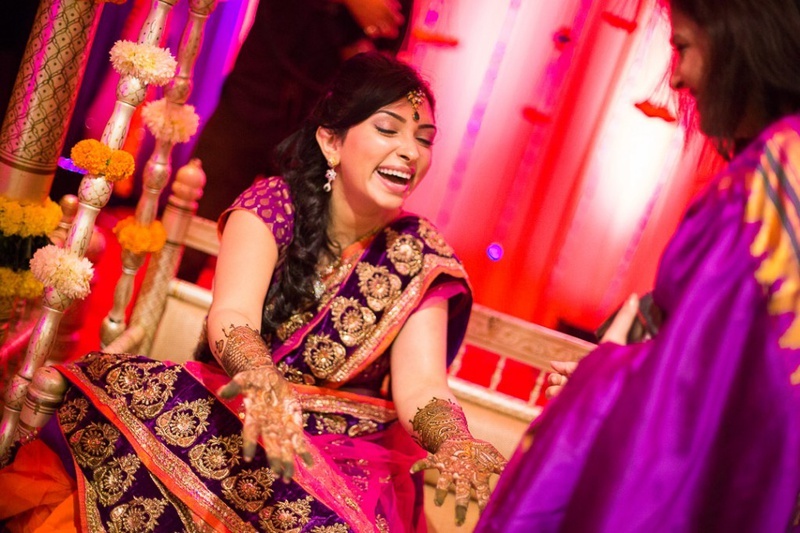 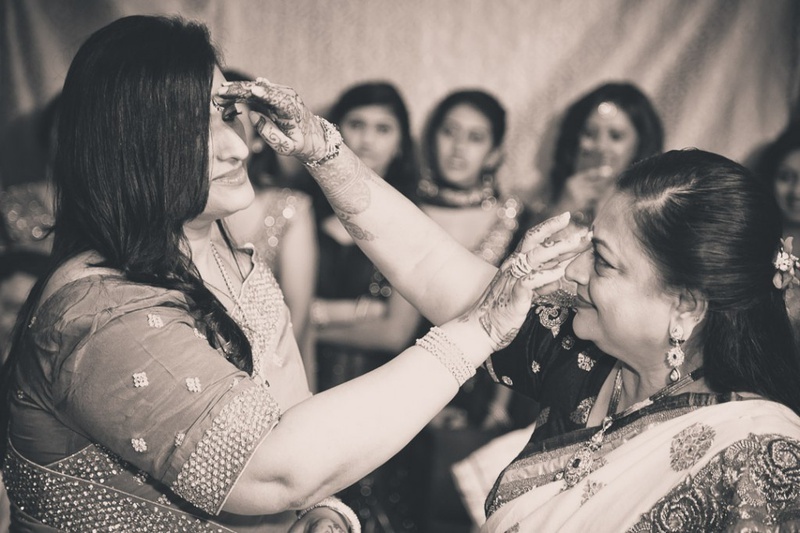 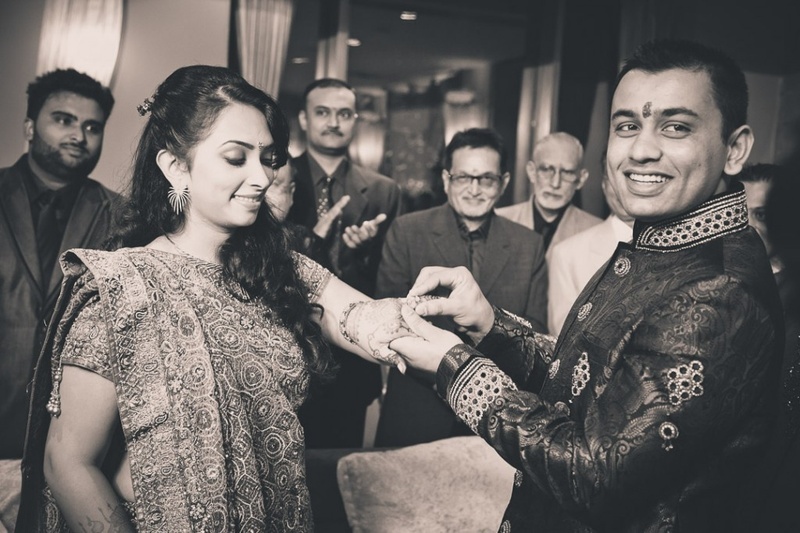 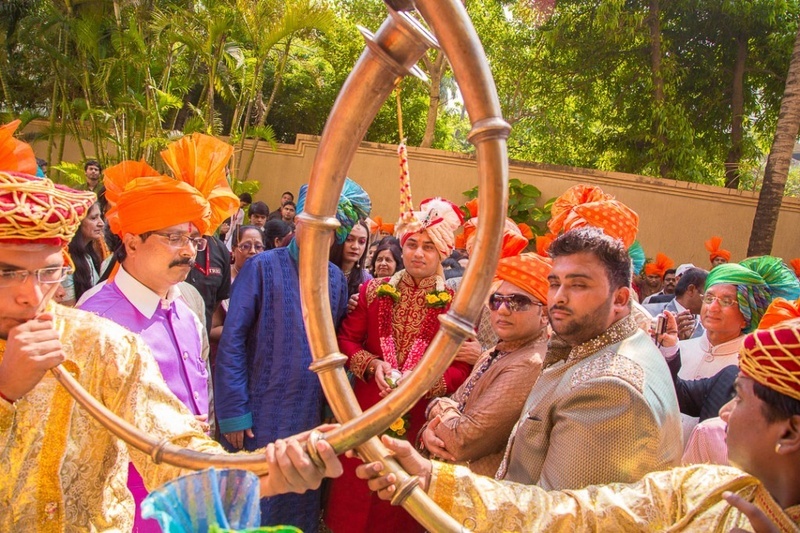 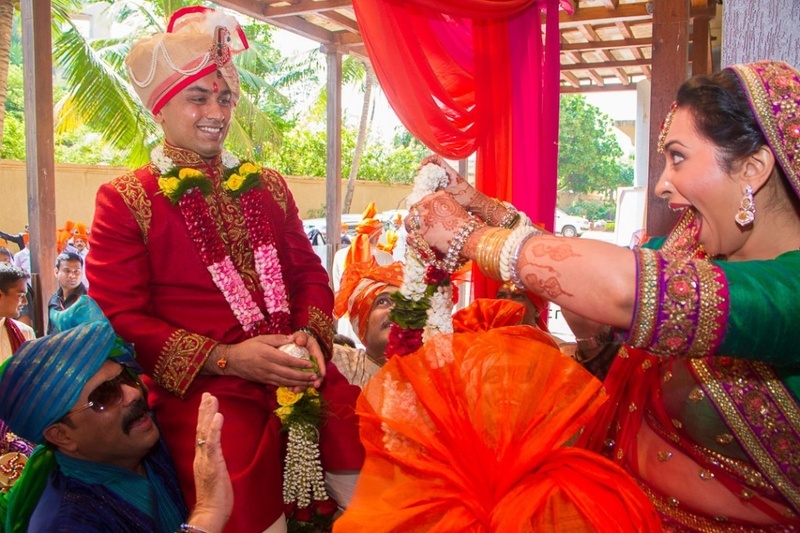 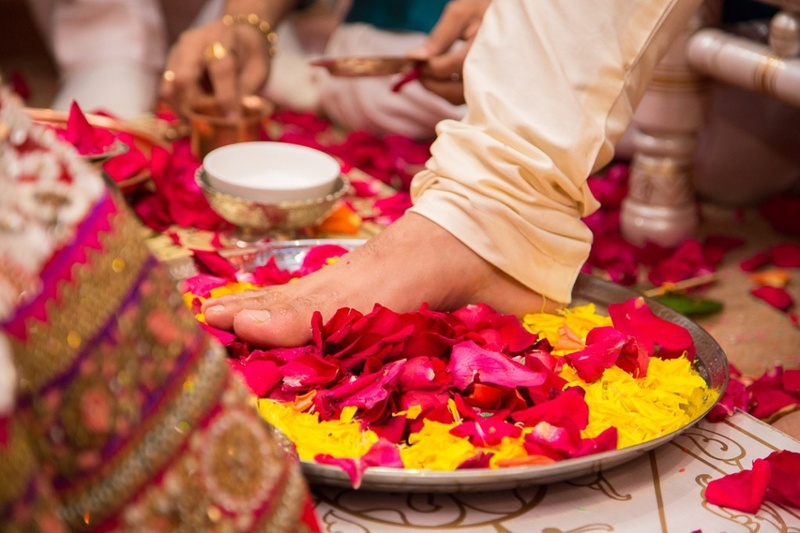 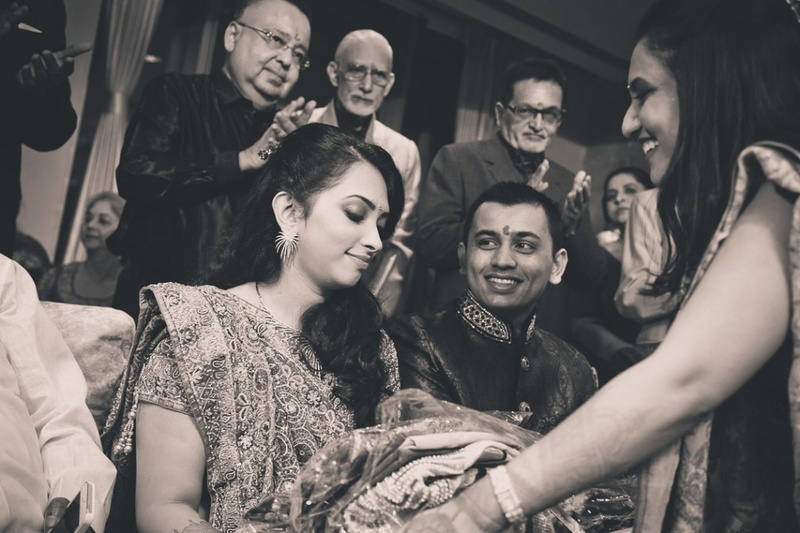 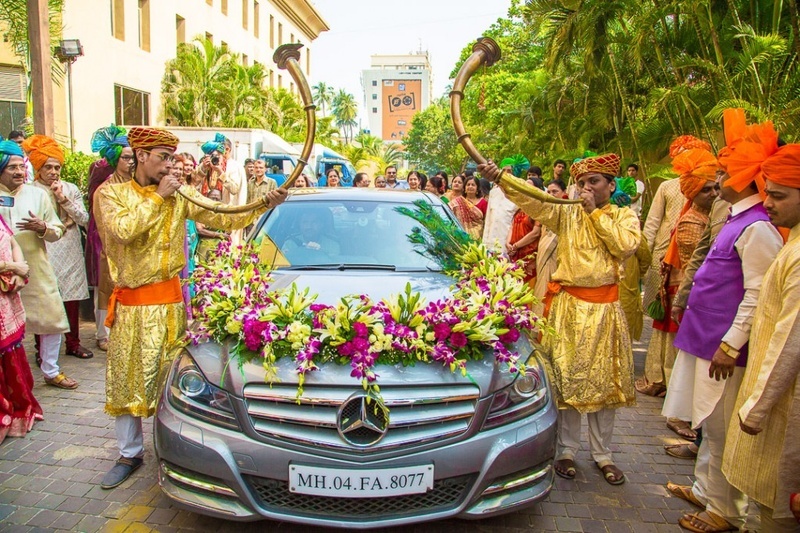 All things bright and beautiful was Santoshi and Gaurav’s traditional wedding celebrations. 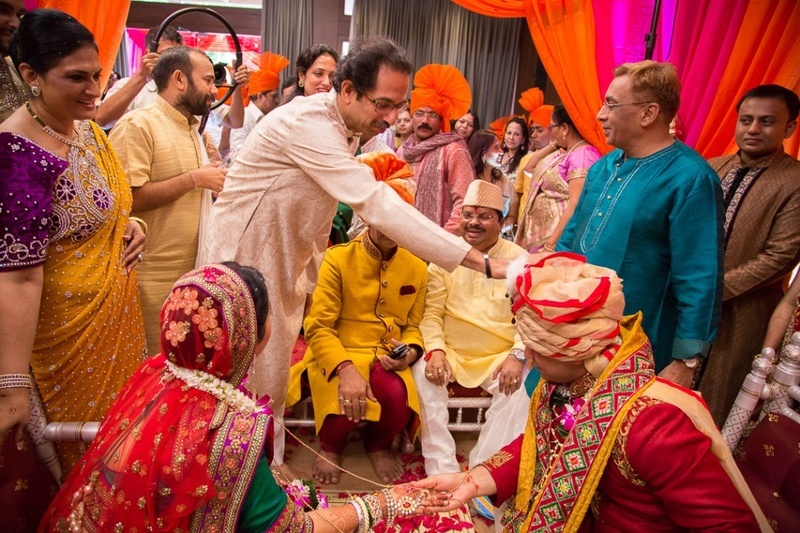 Every function was overflowing with happiness and love – whether it was the mehendi ceremony or the Shaadi itself, this union had high levels of happy energy that we could feel right through our screens. 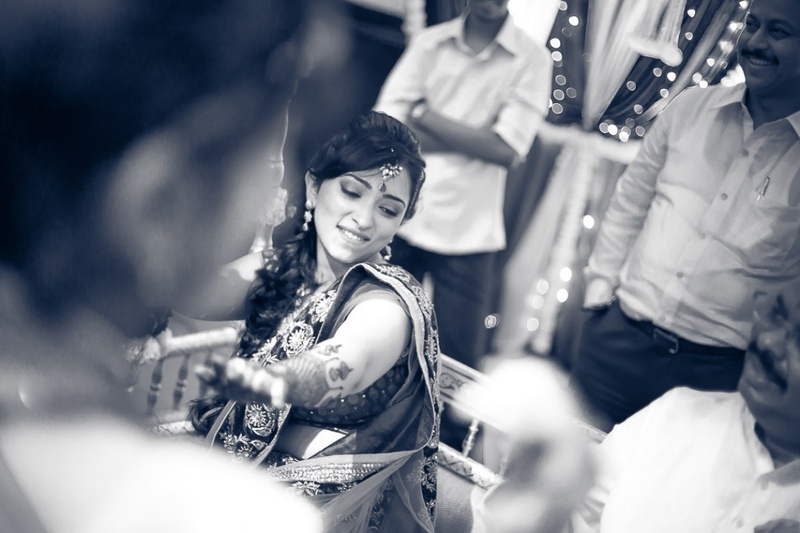 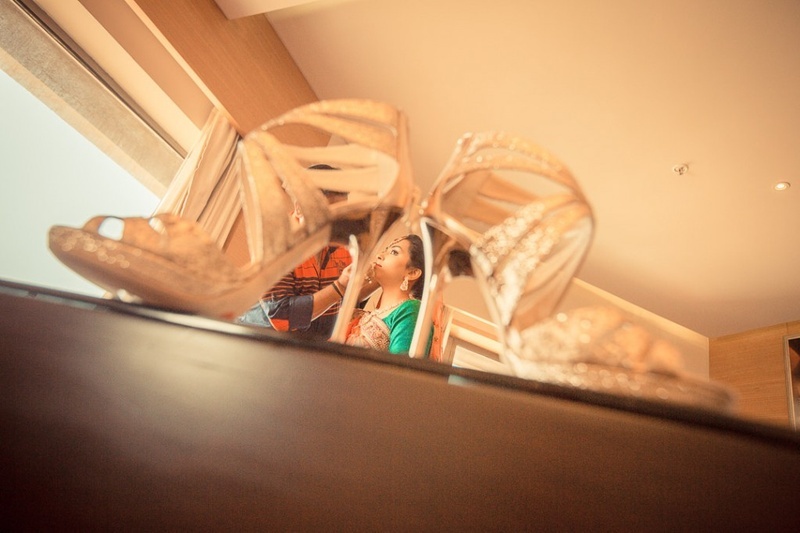 Santoshi was all about style in every outfit she wore through every ceremony. 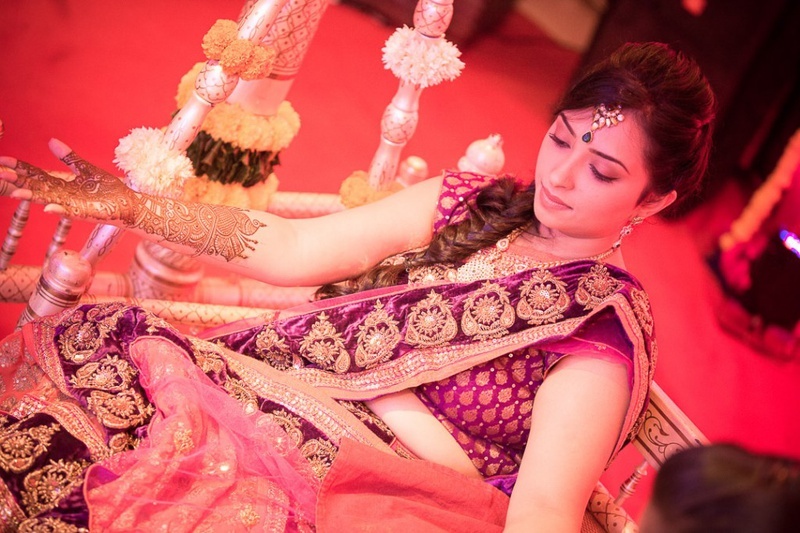 Her jewellery, hairstyles and outfits had us absolutely mesmerized. 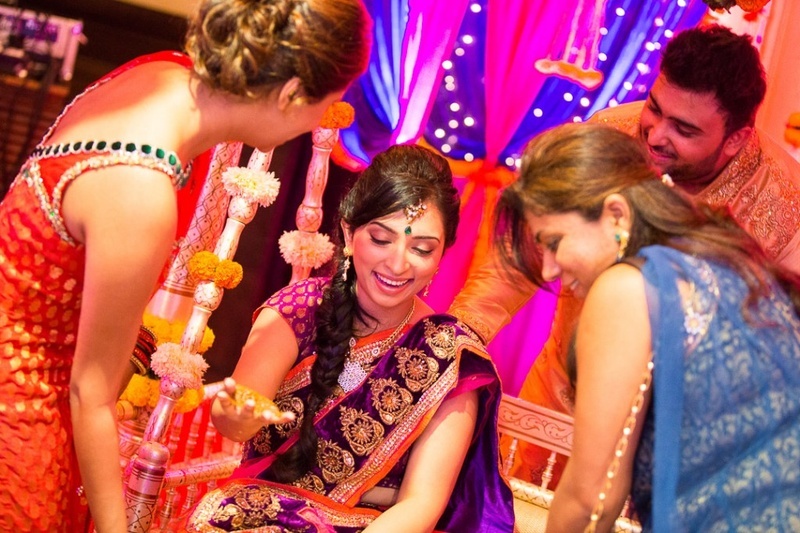 For her mehendi, she wore a purple and pink lehenga which had a velvet border with intricate beadwork and a matching brocade blouse. 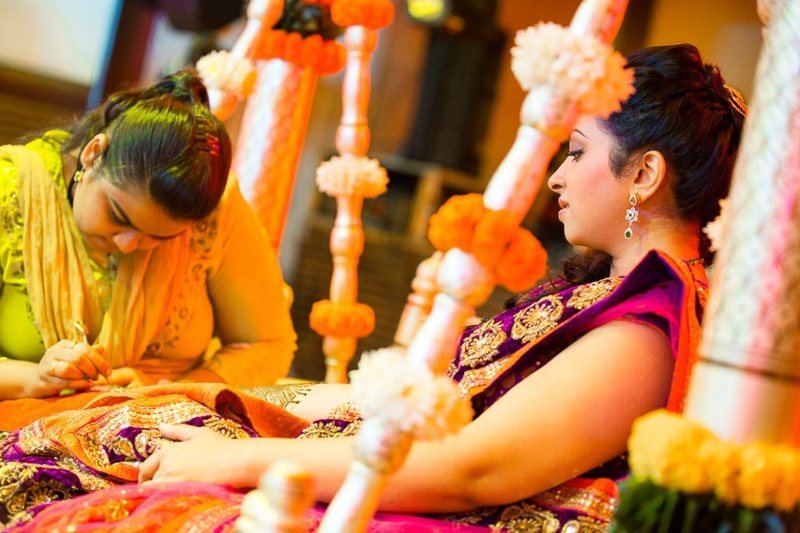 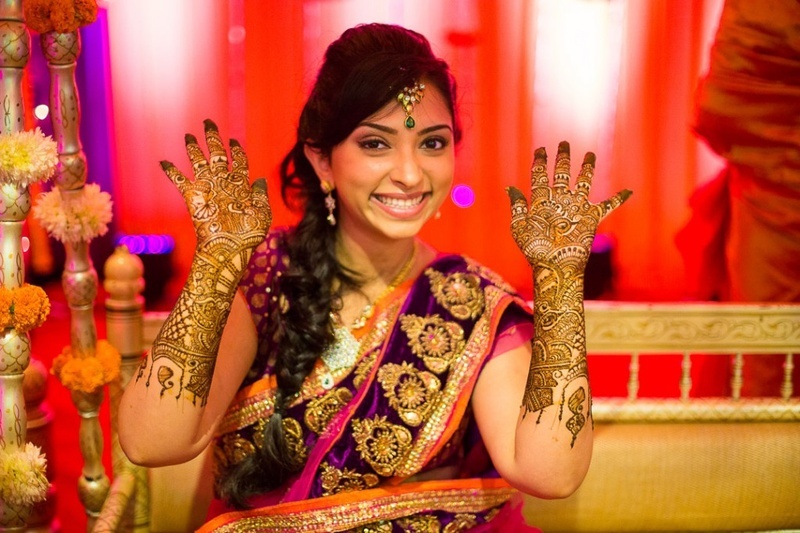 She sat on a florally decorated jhoola where her arms were adorned with detailed bridal mehendi designs. 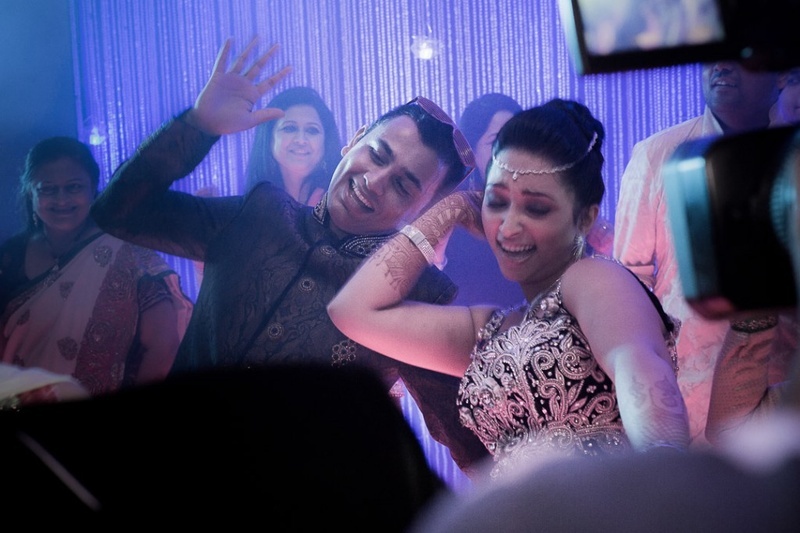 Together with her friends and family, Santoshi danced in celebration of this new phase of life! 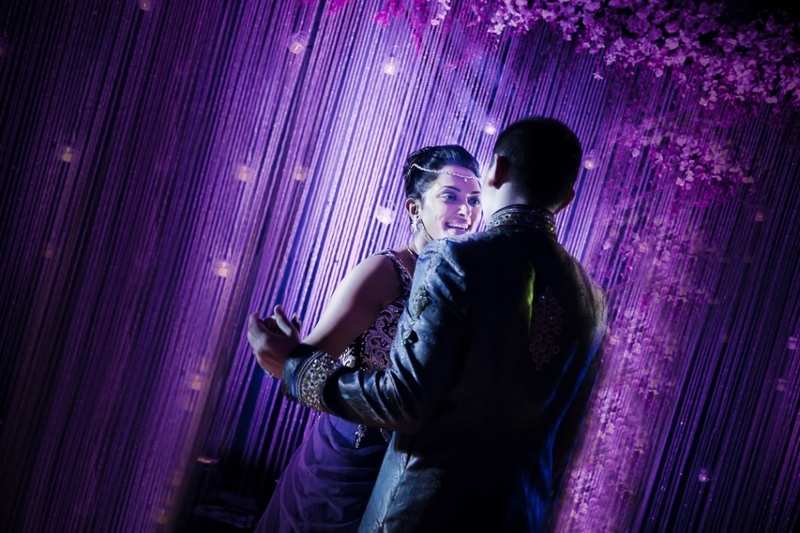 The Sangeet celebration followed in a banquet hall lit with blue and purple hued lights. 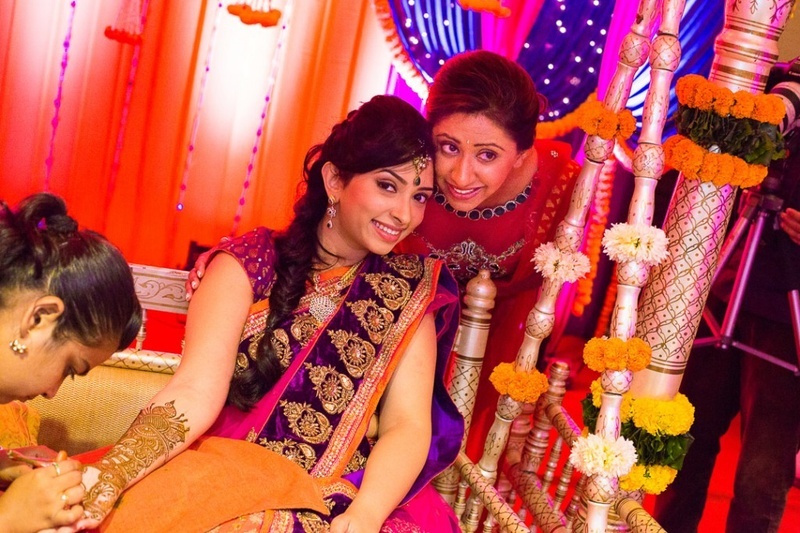 The stage backdrop was just plain stunning! 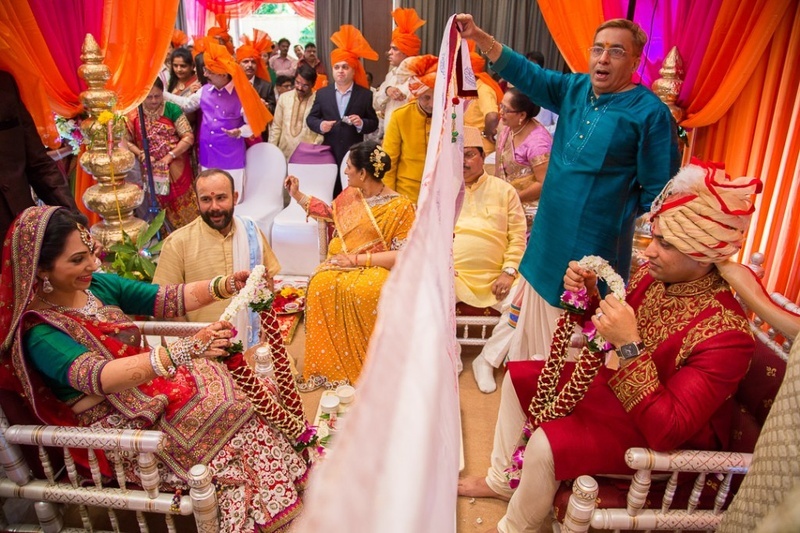 Opulent pearled strings were strung across the back with dainty tealights hung on them – this set up truly gave the entire ceremony a magical feel. 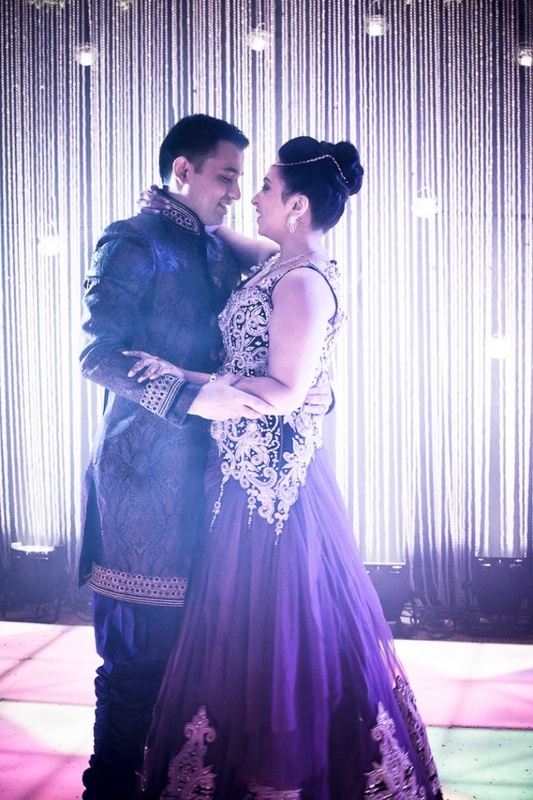 Santoshi wore a navy blue cocktail gown that had a silver and white embroidered bodice embellished with delicate beads and crystals and Gaurav complemented her perfectly in his damask textured bandhgala sherwani. 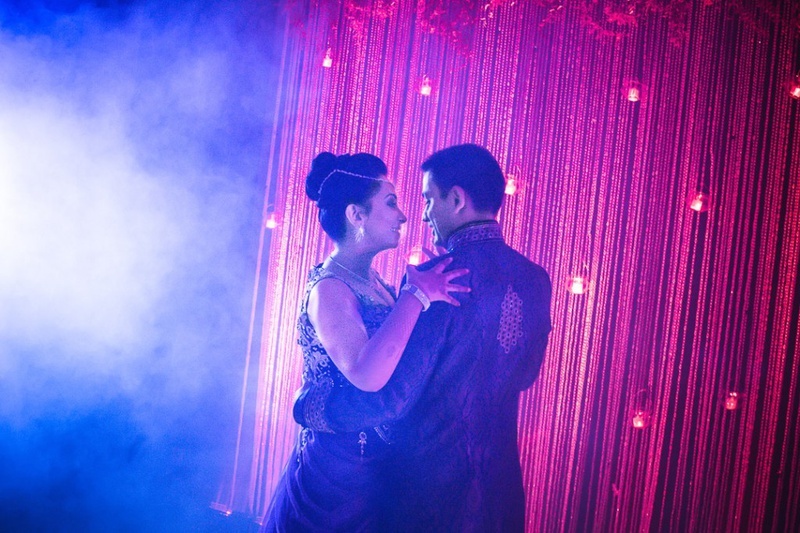 They danced together, lost in each other’s eyes, making the most of every moment spent on that mystical stage. 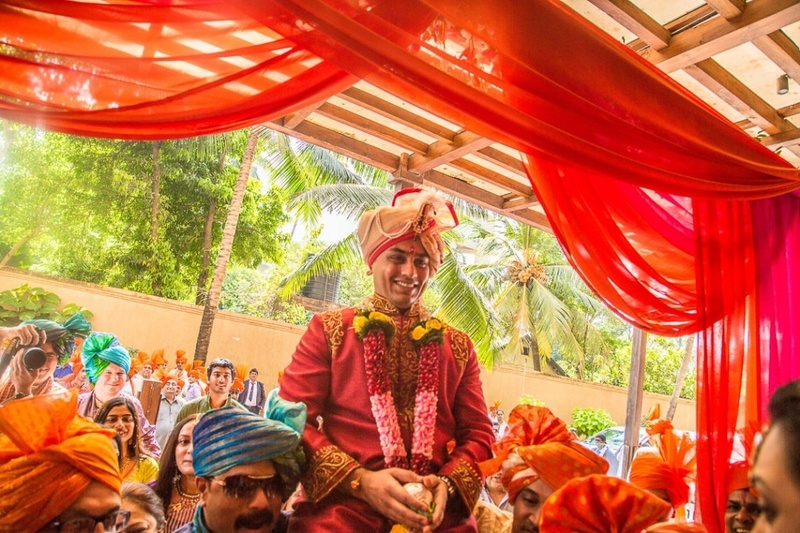 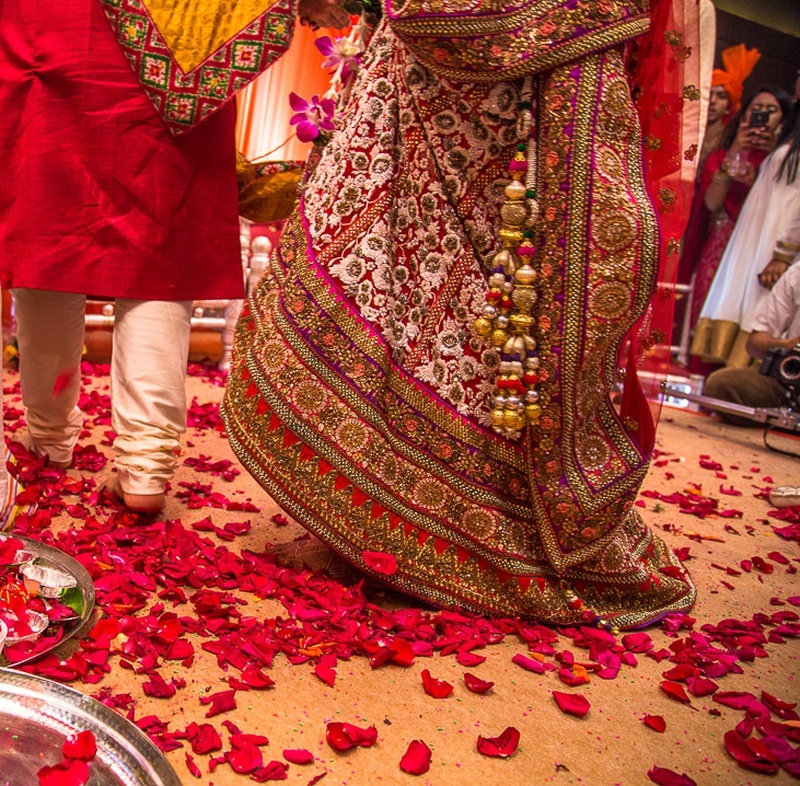 Their wedding ceremony looked like a burst of colors, spilled out everywhere! 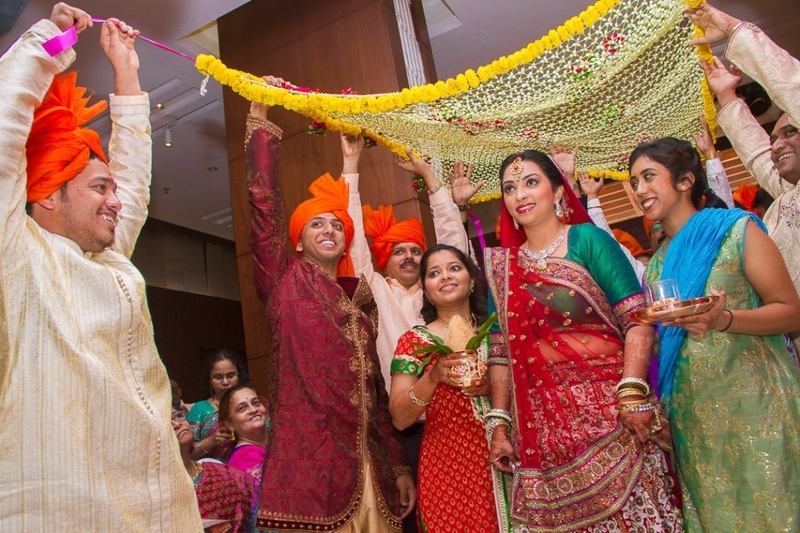 From the bright orange and pink drapes right down to the gold and yellow dressed band-baja walas, every element was made beautiful with vibrant colors. 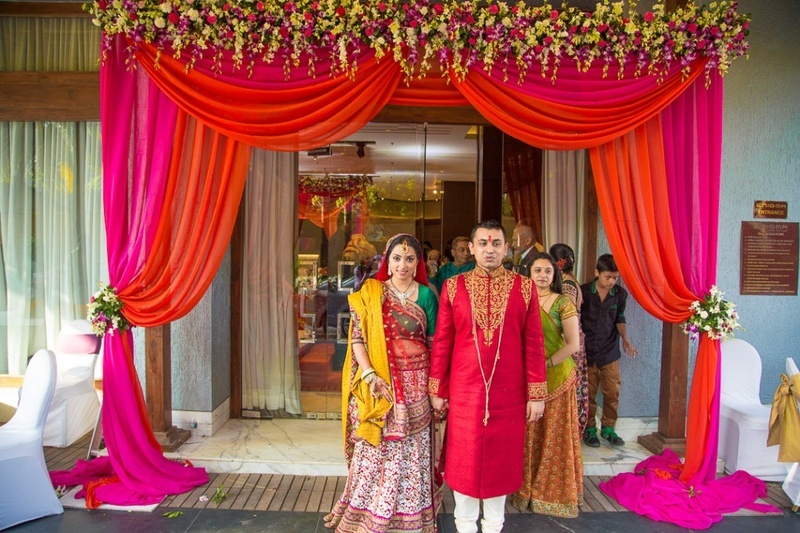 Santoshi entered this beaming venue under a bridal chaadar decorate with marigold flowers wearing a gorgeously embroidered red lehenga that featured a multi-patterned border with delicate sequins and beads. 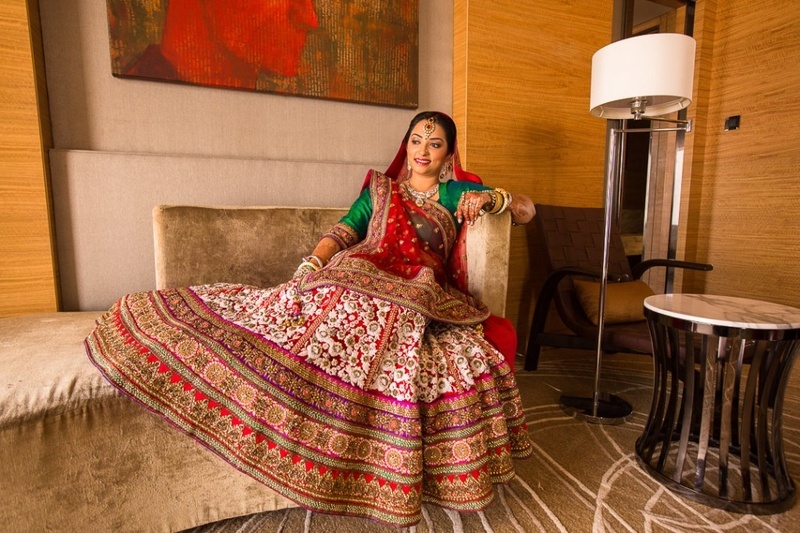 Her ethnic bridal jewellery studded with diamonds and red gemstones added the ideal touch of elegance to her entire ensemble. 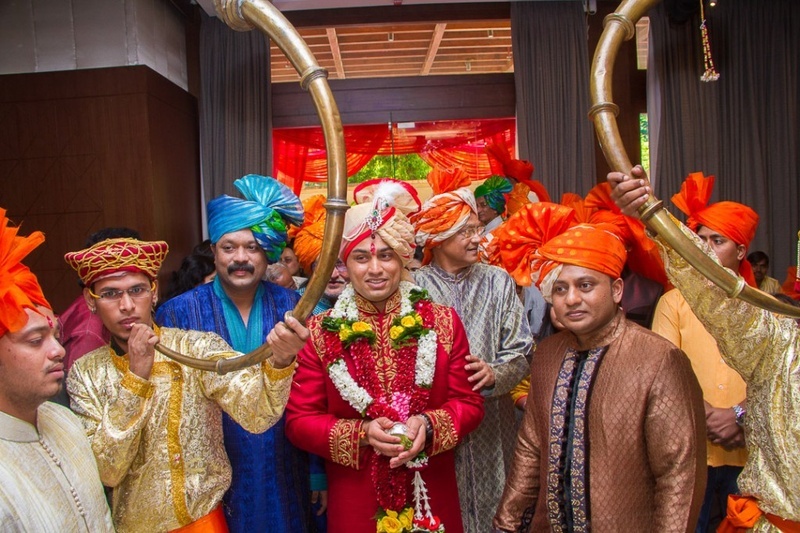 The team at Candid Shutters captured the traditional union of Gaurav and Santoshi with great talent and a keen eye for detail - right from the mehendi ceremony to the Shaadi, they did an amazing job behind the viewfinder!